Its motion traces a lasting line. Thought leads the course and its sequence, to meaning. Aiming for ease of writing. Comforts the writer and frees the mind. The pen maker has accomplished his task. Nib production is the oldest technology in the field of pens with the beginning of mass-production reaching back as far as the early eighteen hundred. This was, of course, before the advent of fountain pens. Then, a writer would fit the nib into a simple holder. At school, when I went, this was how we learned to write… after we had surpassed the slate board. Our fingers were soaked in ink, and so was the timber of the desk around the inkwell. More accomplished writers suffered from an aching longing of being able to write as long as possible before needing to interrupt the flow of writing, the flow of thought. I remember having nibs with small pocket attachments, which would hold a drop of ink by capillary force. When I started investigating fountain pens, the nib production people were the most unwelcoming. They just did not want to tell me anything, not about the manufacturing, the reasons behind specific processes nor the function of the nib. Their behaviour spurred my curiosity, my drive to find out their secrets. I suspected, they did not know as much as I thought. In conniving ways, I would ask them questions (fundamental on ingeneering stuff), and their answers were not quite right. Or, maybe, they just did not want me to notice, how antiquated their production methods were. They behaved as if they were the prima ballerinas of manufacturing. Only later, after working with them, I discovered, these highly skilled people deserved all my respect. However, before this happened, my attention was pulled towards some other pressing problems in another section of manufacturing. Nibs were working well, so I let them go for the time being. The purpose of the nib is to bring the ink to paper and control the ink’s flow. Ink flows when the nib touches the paper and stops when lifted off the paper. How does it do that without using a microprocessor? I would like to ascertain, the appropriate amount of ink required due to various absorption strength of the paper and the line width is controlled by the feed. During my investigations, I found a few myths out there. As an ingeneer, those irrationalities make me smile and wonder where they originate from, as an artist, I can fully appreciate their value in solidifying an emotional bond between user and their product. From this place, the title of this website originated, Fountain Pen Magic. It’s funny, we all call it this way even it has nothing to do with breathing, letting air into the ink reservoir. This is how this chapter started. And one just never stops learning. I completed a study on the feed of Marukin Eyedropper of 1934, which has the air-canal on the top. In this case, the breather-hole does what its name says. From here onwards, I leave the article unchanged. Without mentioning, I am referring to air-canal below situations. 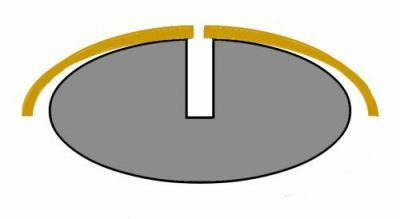 Beside of this, and in cases where nibs are combined with feeds having their air-canals below, the hole’s (other) primary function is to determine the end of the slit and hide inaccuracies during the slitting process. Furthermore, it reduces the stress at this point through distributing the forces across a larger area. It firmly establishes a definite endpoint of the slit; its length influencing the elasticity of the nib considerably. It also helps to position the nib in jigs of manufacture. In diagram 1 I show the location of the “breather-hole” in good feed design. It is not in contact with the ink flow at all. If it is, then the hole being closed through dried out ink is the worst consequence. To mention it in this context: the breathing (allowing air to enter into the ink reservoir) happens through the feed, more about this in the section about the feed, namely: Application to the Feed. 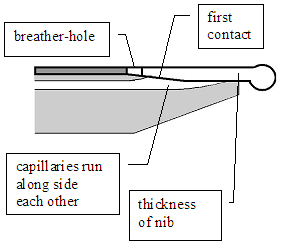 The ink comes along the capillary of the feed, and at one point the upper wall or edge of this capillary is replaced by the underside of the nib, see diagram 2. The ink is not supposed to notice this cross-over. It is imperative that the metal surface is as clean as sterilised; and further, that no gap occurs due to tolerances. At this point, the ink has its first contact with the nib. Preferably, the breather‑hole is located behind this point of contact. Otherwise, it will hinder this cross‑over from the narrow capillary in the feed. In diagram 3, the cross-section at the cross-over shows that the nib sits snug on the feed to reduce any distraction for the ink to be sucked sidewards. Most often the nib radius is larger than that of the feed, to assure the tightness and compensating for manufacturing tolerances. Further down towards the tip of the nib the capillary in the feed and in the slit of the nib run parallel to each other. Because the width of the slit is narrower than the width of the capillary of the feed, the ink has plenty of invitation and surface area to cross over to the nib. Capillary forces of the slit in the nib increase with the narrowing of a slit, thus the ink is sucked quickly towards the bead at the end of the nib. In the section about the setting of the tines, I talked already about the tricks to entice the ink to jump over onto the paper. The maximum flow of ink is mainly determined by the design of the feed, but whatever is delivered then onto the paper is controlled by the absorption of the paper as well as the variation of the slit cross‑section (the thickness of the nib multiplied by the changing of its width). This is another reason why the material thickness of the nib is thicker towards the tip; the thicker the material, the more ink can be delivered to the tip. It appears a natural habit of writers, if they want more ink on the paper, they apply more pressure onto the nib. However, this is useful only to a certain degree. The maximum amount of ink made available by a nib is determined by the original (prior the slit being set) cross‑section of the slit. Pressing the nib harder against the paper and increasing the slit wider than its original width will cause the ink to retract up the slit; hence, the flow of ink reduces, in the worst case, it stops. More severe is the possibly irreparable damage, especially with gold nibs. What is the Purpose of the Slit? It is for transporting and holding a small amount of ink and giving the writer the opportunity to vary the width of the line. If it is well designed this should not affect the saturation of the line, which had been one of the few design criteria at my time (~1980). I have learned that many fountain pen writers like the variation of colour saturation. Times change, as they do. To answer this question about the purpose in more detail, allow me to move one step back. What is the purpose of the nib? Essentially, to transport the ink and cause a fine line on the paper. You can use any pointed piece of wood (toothpick)… even a nail, glass or quill to perform this. Try it. The challenges you will find are: initially, you have to tap the tip onto the paper to initiate the crossover and then you may create a blob because all the ink discharges in one go. It needs a bit of fine-tuning. Fraying the toothpick certainly helps (fibre pen, brush) to release the ink in a more controlled fashion. And if you push your frayed toothpick a bit more, the line will widen. If you are interested in Chines character writing, you would be an expert in this action. The slit, as a singular form of fraying, helps the flow of ink, but with it comes the sensitivity to pressure, because the slit widens. For those who would like to have a reasonably even line width, I recommend steel nibs, the shorter, the harder and the more even the line width. Drawing pens with tubular points provide the ultimate consistency, but they can be a bit scratchy (which can be reduced with 1000 grid polish paper). For those who see the variation of width as part of their creative expression, there are flexible nibs specially designed for this. Generally, they are made from work-hardened stainless steel… most nibs are work-hardened, flexible nibs just more so. Steel or gold? Nibs manufactured from either material can perform excellently if the designer understands the material and the mechanics of a nib. In short, gold costs you more, that’s all. This concludes the description of the function of the nib. There are further aspects to consider, which I explain the following articles at times when they are relevant to the manufacturing process.